Flannery O&apos;Connor&apos;s astonishing and haunting first novel is a classic of twentieth-century literature. It is the story of Hazel Motes, a twenty-two-year-old caught in an unending struggle against his innate, desperate faith. He falls under the spell of a &apos;blind&apos; street preacher named Asa Hawks and his degenerate fifteen-year-old daughter. In an ironic, malicious gesture of his own non-faith, and to prove himself a greater cynic than Hawks, Hazel founds The Church of God Without Christ but is still thwarted in his efforts to lose God. 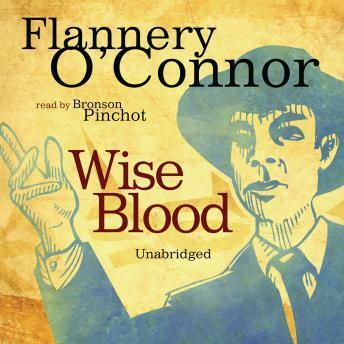 He meets Enoch Emery, a young man with &apos;wise blood,&apos; who leads him to a mummified holy child and whose crazy maneuvers are a manifestation of Hazel&apos;s existential struggles. This tale of redemption, retribution, false prophets, blindness, and wisdom gives us one of the most riveting characters in American fiction. Great for people who are on the go. The app works well although it has room for improvements. There is no way to rewind or find a place further in the audio without moving the cursor and hoping you find what your looking for. This should be divided in chapters or at least it should indicate what chapter your on. I didn't realized that this was Flannery O'Connor's first novel, and it "reads" like a first novel - a lot of false starts; too much detail in some places; not enough detail in other places; and, spotty character development. The only reason I gave it 2 stars (instead of 1) is by because of the author's reputation as a Southern writer.